The tag was retrieved from the bin and updated with an ikat background and suddenly it seemed much more interesting! I used just one splodgy image from Stampin' Up's free Eyecatching Ikat set and, because it's a clear stamp set, it was so quick and easy to stamp it in a brick pattern. My tag was mounted onto Pistachio Pudding core'dinations card stock, which I love for its subtle texture, and I trimmed it with a piece of card stock cut with the tiny scallop blade in my Rotary Addition. The sentiment and ribbon were added in the same bright Pumpkin Pie colour - I love the way everything matches! 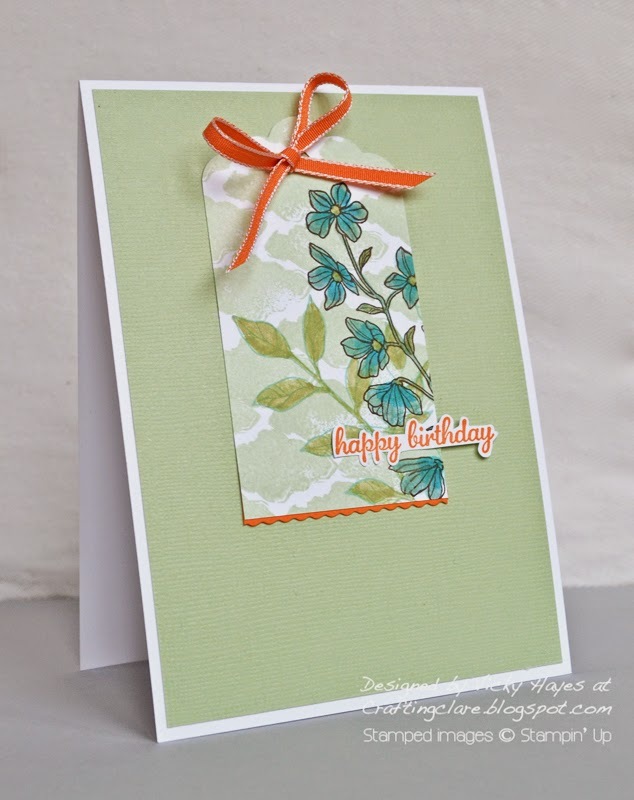 I shall be linking this card up with Seize the Birthday where the optional topping is to use a tag on a card; and ATCAS where the cue word is Texture. I did manage to get out into the garden yesterday, despite the rain, and you'll be glad to know that the Rambling Rector has been firmly put in his place. My children are off school for half term so my youngest son joined me and helped me plant some sweet pea seedlings. While we built the support for these, he told me about how much he'd enjoyed Gardening Club at primary school where they had grown all sorts of vegetables and flowers including sweet peas. "I remember that to make the flowers grow," he told me, "we had to snip the pods off with er... what are those pointy things?" I giggled. "Fingers?" He looked at me sternly. "Secateurs!" he said. Vicky, your card is beautiful, and I agree with you about the background. the splash of orange makes everything pop. First up - thanks for adding the "Singing in the Rain" video clip a couple of days back, I couldn't help but laugh!!! The colours you used today are quite eye-catching and for a "bin" project, it looks terrific. I'm so glad you rescued the original piece of card. Lovely card for a bin retrieval!! And weren't you put in you place in the gardening department by the budding Alan Titchmarsh. I am so glad you retrieved this tag...and adding the Ikat was a perfect solution, although your coloring was very pretty without it! it does take it up a notch, however!! Thank you for sharing this at Seize the Birthday! 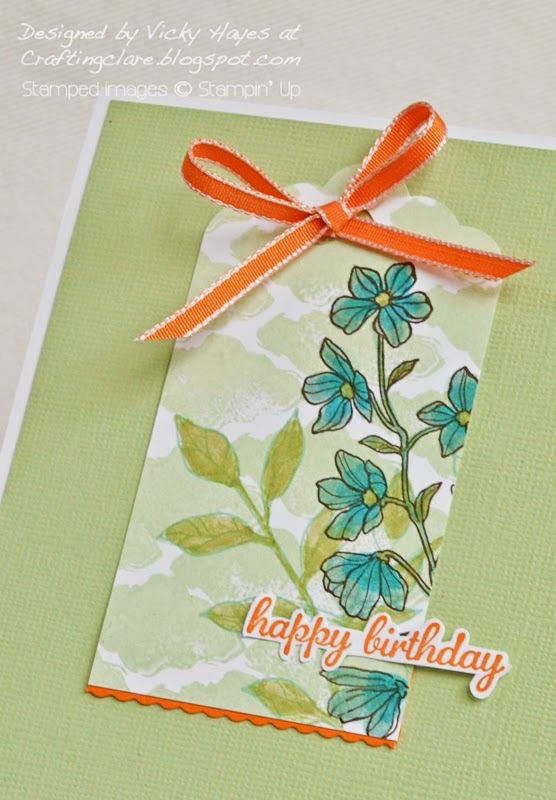 Pretty tag on a card! I adore that look~ Thanks for joining in with ATCAS! Hi Vicky such a pretty card and the dash/slash of orange is a perfect accompaniment to it. Thanks so much for joining us again at ATCAS always such a pleasure too see you here. Great card Vicky - so glad you saved your pretty tag! Thanks so much for joining our challenge at ATCAS. Gorgeous tag card Vicky. Love the pops of orange! Thanks for joining us at ATCAS. Your tag is beautiful! Love the CAS design and the great colour combo. Thanks for playing along with Seize the Birthday.